A delicious quartet of stories to celebrate the first anniversary of marriage equality. Poignant, tense and at times horrific, some are based on personal experience. It’s humbling to read these tales of ordinary people who just want to get married, to have legality as well as equality. It isn’t about swans and over-the-top nuptials, just the simple fact of being acknowledged and recognised as a legal married couple. That right has been denied for so long, and to hear the things that some couples have been through is shocking, though sadly all too true. What happens when your partner is involved in a terrible accident and taken to hospital in a coma, but because you are not legally “next of kin” his family are entitled to keep you from seeing him? Alex has made a terrible mistake and is desperate to be by Gio’s side and talk him out of his coma, but Gio’s mother has other ideas. Alex has always resisted the idea of marriage, thinking it’s an unnecessary formality, but now he will do anything to make sure Gio knows he really is committed to him. If he ever wakes up. A romantic tale from a terrific author who knows how to tug at the heartstrings. Jeordi is also involved in an accident, and has bigoted parents who disagree with his relationship with Tom. Despite all the odds, they run away to get married in another state, only to be thwarted by a Kim Davis-like figure who won’t do her job on account of her “beliefs.” Then their luck changes, and the gay community rally round in the best way possible. A sweet, romantic tale with an undertone of despair from another accomplished author. Jay and Wallace are destined to be together, but somehow, keep missing each other. When they finally do get together, it isn’t all sparkles and cupcakes. They have obstacles to overcome and have to stay strong. 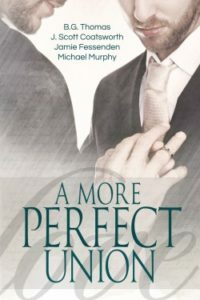 Their love is the tie that binds them, but this story illustrates that HEA’s do not come easily if you’re not straight. I love Jamie Fessenden’s writing, and his warmth for these characters shines through. A massive story, crammed into a shorter one. It all starts with a shoelace, and turns into a love affair that at first seems unrequited. Lucas is the boy determined to marry Dalton, from their first day at kindergarten. In less skilled hands, this might have seemed stalkerish, but it doesn’t. It works, from teenage antics to deep lasting love, Thomas has created a grand love affair between characters that deserve more than just a short story. So in effect, all four of these tales touch on the problems that gay couples have come up again and again, even since the marriage equality bill was passed. There is a lot of work still to do, yet they are ultimately uplifting, all very different, and massively enjoyable to read. I learned a lot, but also, could not put this book down. The writing is exemplary in all cases, so it’s impossible to pick a favourite. Love against the odds, the importance of honesty in relationships, the need to be strong in order to fight for the things that others take for granted. Every Bridezilla should read this, and be bloody grateful she has never had these kind of issues to deal with.